Having received a 1000 Euro bill on a 4 hour intake for a detox programme I thought: might as well set up my own camp. And, I am guessing with that I have come to complete all the exclamations of an ex-addict in repair. Like ‘I can do this by myself’ and ‘I am sure I will never drink again.’ and what have you? My book on Addictive Thinking has not arrived yet so I am not totally up to date with my own cunning. However, I did think I’d draw up a ‘addict bingo’ like you have ‘buzzword bingo‘. 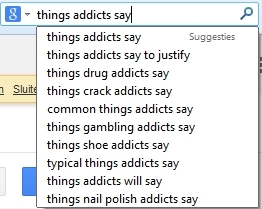 So I turn to Google and search on addict bingo to get some inspiration. 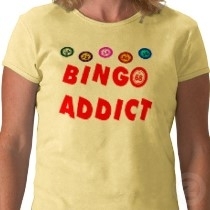 Works out that one can actually get addicted to bingo….. 😦 So, no results on addict bingo. Loads on bingo addict.. So maybe I can, say, start to do something useful with my time. Like have a life. Do The Plan.